Welcome to the Home Page of the GMC Montpelier Section. 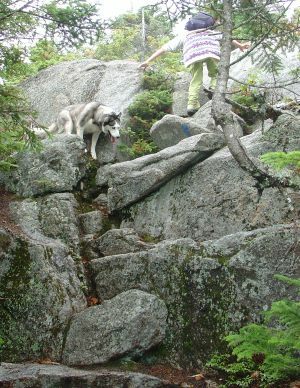 The Green Mountain Club (GMC) maintains Vermont's Long Trail (LT), a 270 mile trail from the Massachusetts state line to the Canadian border. The LT was begun in 1910; it is the nation's first long distance hiking trail. GMC has fourteen sections; GMC members can belong to a section or can be At Large. 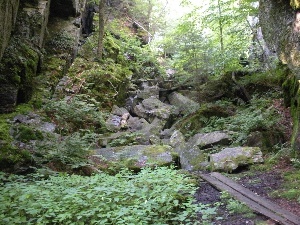 The Montpelier Section of the GMC maintains two portions of the Long Trail - Bamforth Ridge (Gorham Spring to Jonesville) and Smugglers' Notch (Picnic area to Chilcoot Pass), including the overnight sites Bamforth Ridge Shelter and Sterling Pond Shelter. The section also maintains the Sterling Pond Trail (former LT). See the Tour page. Our outdoor events are open to everyone, and we charge no fee. Our outings are almost always day trips, but do extend to portions of New York and New Hampshire, as well as Vermont. Please talk with the trip leader about a hike if you have any questions. The section's quarterly newsletter is mailed to all members. (The current issue and past issues are in PDF format.) Some issues have both reduced size and Hi Def versions. Some events listed in the mailed newsletter may not appear on our web site. The web site listings can show updates made after Trail Talk is printed. Our Smugglers' Notch work hikes (fall and spring) concentrate on the LT from the picnic area to Sterling Pond, and the Sterling Pond Trail. The Bamforth work hikes concentrate on the trail from River Road to the Bamforth Ridge shelter. We hit other portions of our trail as needed. The work hikes are suitable for everyone able to walk the trail, especially those able to wield a leaf rake. The Young Adventurers' Club ( ) was established in 2006 as a new group within the Montpelier Section to get parents and kids 0-6 years old outdoors, to hike, play, learn, and make friends. The age range may change as the founding toddlers grow older. The Trekkers ( ) are a group of people who like the outdoors, enjoy each other's company, and believe in staying active. We get together during the week to hike, bike, paddle, ski, or snowshoe, depending on the season. Everyone is welcome; you don't have to be retired to join! Outings are announced by e-mail only, often just a few days in advance. To be added to The Trekkers e-mail list, contact Nancy Jordan at trekkers@gmcmontpelier.org. We are volunteers. Our officers and trip leaders receive no reimbursement for their time, energy, or travel. The section does pay actual costs for producing and mailing Trail Talk, for this web site, for renting meetings halls (e.g. annual meeting), for trail maintenance tools, and for training programs. Our income is from donations and membership dues. You can help by joining the GMC (if you are not already a member), leading a event (you don't need special training or skills), serving as an officer (let our nominating committee know of your availability in January or February), or by helping with the web site. Dues for membership in the Green Mountain Club are independent of section membership -- you pay the same dues whether or not you are a section member. If you are a section member, the section receives a portion (currently 25%) of those dues. If you are a GMC member but not a section member, you are an At-Large GMC member. Some questions about GMC membership are answered on the GMC Overview and Benefits page. To Join (or Renew) click on the Join/Renew button at the top of that page. -- We hope you will select Montpelier as you Section, under the "Choose Your Membership Section:" pull-down. Our annual meeting is held in early April. A simplified navigational bar was installed in 2012. At the top of every page is a horizontal row of links to other pages. Running your mouse over these options should display further options. The pictures in the left column are selected at random from photos on our web site, mostly those included in Trip Reports. The link takes you to a web page displaying the image and may provide a caption and explanation. We may display additional information if the camera embeds it in the image file. Reloading this page displays another selection of randomly-selected images from the 1502 photographs stored on the web site.